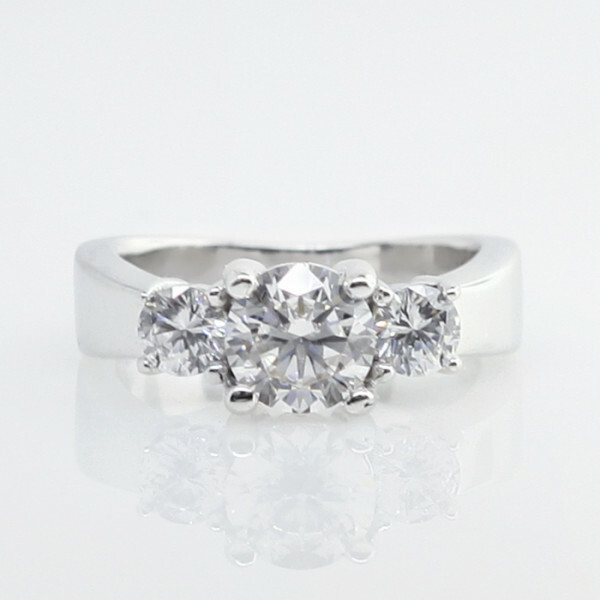 Discontinued Bettie with 1.03 Round Brilliant Center, 1.53 tcw - 14k White Gold - Ring Size 4.5-7.5 was added to your cart. The Bettie is one of our featured engagement rings from our three stone engagement ring collection. This solid 14k gold band flares gently at the sides and tapers at the top and bottom, drawing the eye in to its dazzling three Round Brilliant Nexus Diamonds at the center and giving you the comfort of a wider band. Center Stone: 1.03 carat Round Brilliant Nexus Diamond, 1.53 Total Carat Weight.